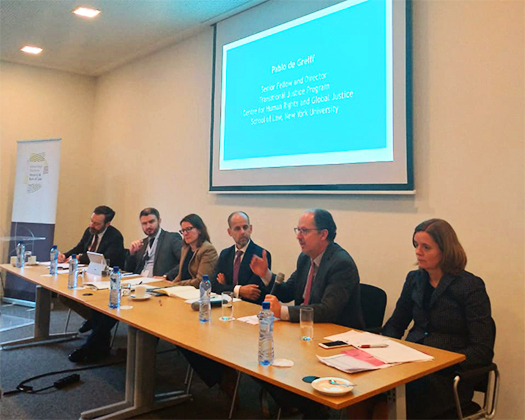 On February 8, at the Peace Palace in The Hague, the high-level international Task Force on Justice met to finalize its report on increasing access to justice for people and communities around the world—or reducing the “justice gap”—as an integral element of the Sustainable Development Goals (SDGs). The Task Force’s recommendations will play a crucial role in shaping discussions leading up to and during the 2019 UN High-Level Political Forum on Sustainable Development this summer and fall, when UN members states meet to review and follow up on the 2030 Agenda for Sustainable Development and adopt new political commitments. Drawing on the relevant data to propose evidence-based solutions to justice problems, and taking a people-centered approach, the Task Force is using its report to argue that justice and the prevention of violence constitute a necessary platform for development. On the same day, members of the Working Group on Transitional Justice and SDG16+—comprising NGOs, international organizations, and government representatives— presented at a side event the working paper it had prepared over the past year in support of the Task Force. In this paper, the Working Group makes the fundamental point that while the SDGs are universal, they cannot be achieved in the same way in every context. In particular, it contends that massive and serious human rights violations create conditions in which extraordinary justice interventions are required to make progress toward sustainable peace and development. In countries experiencing or emerging from violent conflict or repression, reducing the justice gap is often largely about addressing massive violations and the widespread grievances associated with them. In Syria, for example, where more than 400,000 people have died as a result of the war, more than 12 million have been displaced, and tens of thousands are missing or disappeared, or in Colombia, where the toll of the armed conflict included more than 8.5 million victims, the scale and severity of abuses requires extraordinary responses to meet society’s immense and complex justice needs. Today, ongoing crises or cycles of violence affect countries such Yemen, the Democratic Republic of Congo, the Central African Republic, South Sudan, Ukraine, and Myanmar. Transitional justice represents a set of such extraordinary responses, often delivered during critical junctures such as transitions from war to peace or from authoritarianism to democracy. Transitional justice is meant to both redress gross violations and identify avenues to address the structural causes of those violations, such as gender inequality and social exclusion. While transitional justice includes criminal accountability, it is undergirded by a broader understanding of justice that takes into account a range of victim needs and societal priorities. Transitional justice is necessary so that the SDGs do not leave behind communities in countries that have experienced massive rights violations. Germany and other post-World War II European countries, as well as Argentina, Chile, and other countries in Latin America, South Africa, Liberia, Sierra Leone, Indonesia, Timor-Leste, and former communist countries in Eastern and Central Europe have all had to address—and continue to address—the legacies of mass violations. Countries currently engaged in complex processes to deal with their pasts include Tunisia, Colombia, Nepal, and The Gambia. And countries now experiencing conflict, repression, and economic and social injustice, such as Syria, Yemen, and Venezuela, will have to do so in the future. Using the same prevention lens as the Task Force, the Working Group on Transitional Justice and SDG16+ contends that context-specific and innovative responses to gross human rights violations can help stop the recurrence of violations, specifically, and violent conflict and authoritarianism, more broadly. 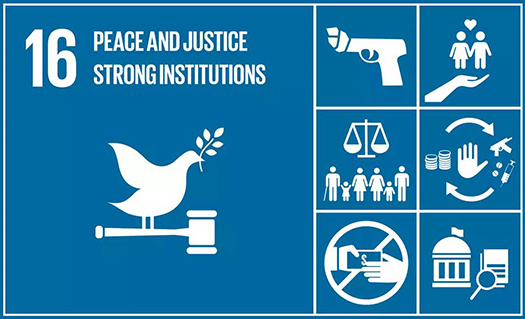 It can do this in ways that contribute to different SDGS and targets, such as increasing access to justice, strengthening the rule of law, making institutions more legitimate and trustworthy, repairing divisions between citizens and groups, addressing marginalization and corruption, and promoting gender equality. The Working Group also highlights innovative strategies, tools, and approaches to resolving justice problems in contexts of massive violations. In order to expand access to justice and make institutions more inclusive, for example, transitional justice cannot be limited to top-down interventions driven by national state institutions; it must instead include initiatives led by local governments and/or civil society or other non-state actors. Furthermore, the scale of injustice itself means that it is critical for victims to participate in the design and implementation of transitional justice measures to ensure their legitimacy and effectiveness and local ownership of them. Transitional justice can also account for tensions, such as those between short-term instability and long-term change, and build bridges between the past, present, and future. While short-term instability may always be a risk of any political intervention, for example, political settlements often change over the long run and become more inclusive, in response to demands for transitional justice. Transitional justice can also help dispel the notion that justice is about the past and development is about the future by connecting special or ad hoc mechanisms to more permanent institutions, such as the national justice system. The SDGs set out a universal agenda with clear objectives. Though the SDGs do not refer explicitly to massive human rights violations, transitional justice still contributes to their objectives. Furthermore, the SDGs provide political opportunities to make the case that the legacies of massive human rights violations should be addressed as part of the agenda. On February 8, the Working Group on Transitional Justice and SDG16+ made this case, and it will continue to make the case throughout the run up to the 2019 UN High-Level Political Forum on Sustainable Development. The Working Group on Transitional Justice and SDG16+ has developed a number of recommendations. For the list of these recommendations, click here. The activities of the Working Group are supported by the Knowledge Platform Security and Rule of Law’s Knowledge Management Fund (www.kpsrl.org).